The publication deals with integrity of domestic institutions regarding compliance with laws and good practices in the public procurement segment. Findings of the publication are derived from publicly available audit reports and other backgrounds that deals with how domestic institutions are purchasing the necessary goods, works and services, primarily from the point of regulations, but also from the standpoint of the recommended good practices. The publication provides an interesting classification of domestic institutions to critical, bad and good practices, and explanations why institutions are classified in these categories. Furthermore, the most frequently detected irregularities are explained and statistically illustrated according to various principles of public procurement, such as good planning and preparation, transparency, equal treatment, control of execution, etc. In order to confirm the observed patterns, the Study also lists numerous illustrative examples from the public-sector audit reports. 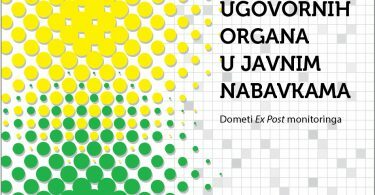 Finally, the Study makes recommendations for improving the integrity of public procurement in BiH. 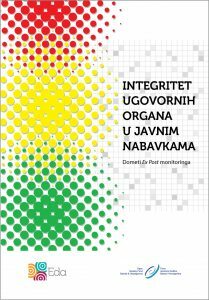 The Study was prepared within the project “Towards the integrity of contracting authorities in public procurement” supported by the Open Society Fund BiH and it can be downloaded here.